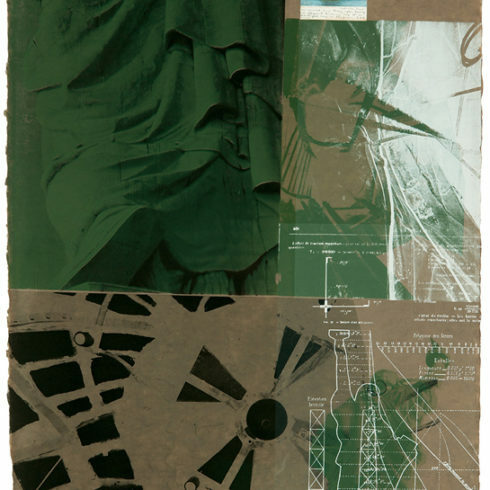 Robert Rauschenberg, Quattro Mani I is a screenprint in colors on Lanaquarelle wove paper with the blind stamp of the publisher. 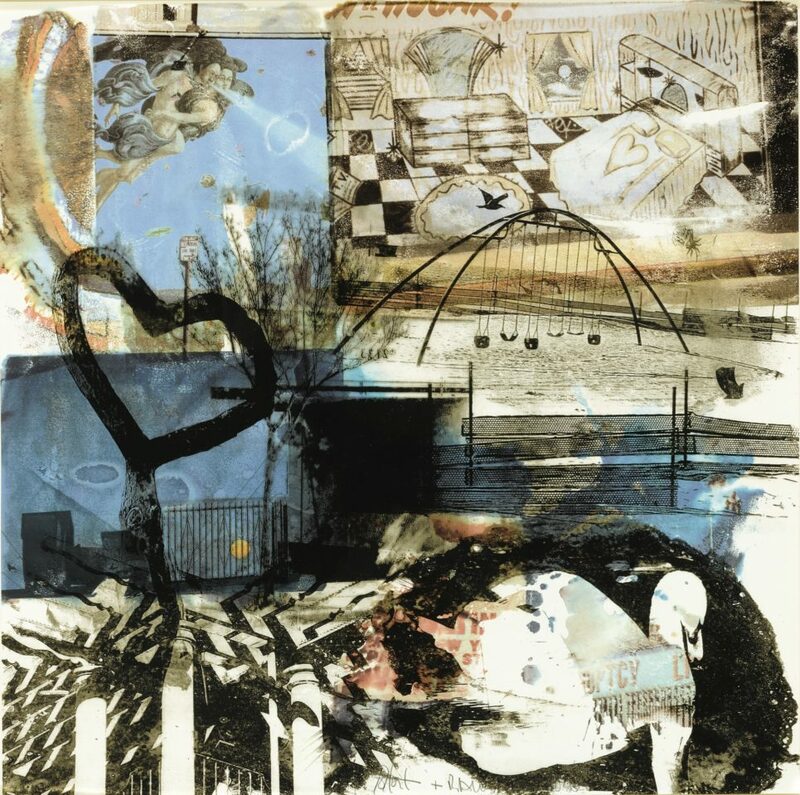 This work was made as a collaboration between Rauschenberg and Darryl Pottorf. This print was published by Gemini G.E.L., Los Angeles with their ink stamp on the verso. 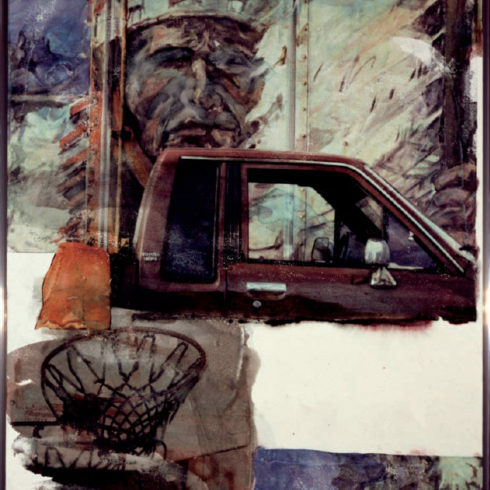 It is signed in pencil by both Robert Rauschenberg and Darryl Pottorf in the middle of the print. This print is from the Quattro Mani series. Darryl Pottorf was Rauschenberg’s chief studio assistant in the early nineties (to 1998). Pottorf travelled with Rauschenberg and working on most of his projects. Pottorf also took over managing the business and assisting with installations, working directly with the galleries and museums. 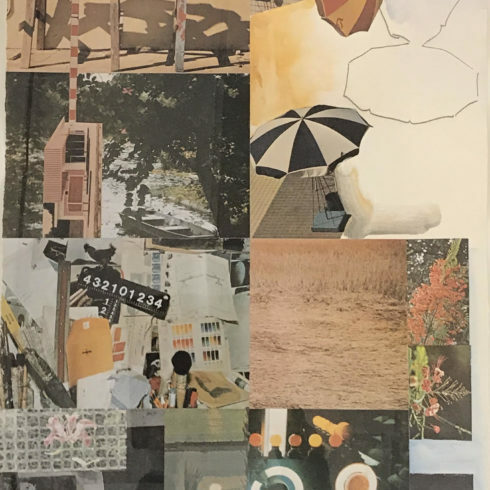 Pottorf and Rauschenberg attend the Bienale in Venice, Italy and d’Adelaina von Fürstenberg suggests Rauschenberg and Pottorf collaborate for the Art For the World exhibition during the 96 Bienale. The collaboration led to set of paintings (Winter Quattro Mani) and 2 print projects at Gemini G.E.L. (LA Quattro Mani and Quattro Mani Marrakech). Darryl Pottorf was Rauschenberg’s chief studio assistant in the early nineties (to 1998). Pottorf travelled with Rauschenberg and working on most of his projects. Pottorf also took over managing the business and assisting with installations, working directly with the galleries and museums. Pottorf and Rauschenberg attend the Bienale in Venice, Italy d’Adelaina von Fürstenberg suggests Rauschenberg and Pottorf collaborate for the Art For the World exhibition during the 96 Bienale. The collaboration led to set of paintings (Winter Quattro Mani) and 2 print projects at Gemini G.E.L. (LA Quattro Mani and Quattro Mani Marrakech). Robert Rauschenberg was a prominent member of the American Post-War avant-garde. The artist’s sculpture-painting hybrids known as Combines, broke through the two dimensionality of the canvas at a time when Abstract Expressionism dominated the scene. His seminal Neo-Dada work, Erased de Kooning (1953), consisted of ritualistically wiping out an original drawing he purchased from the famed painter. “I don’t really trust ideas, especially good ones,” he once said. “Rather I put my trust in the materials that confront me, because they put me in touch with the unknown.” Born Milton Ernest Rauschenberg on October 22, 1925 in Port Arthur, TX, he was drafted into the Navy during World War II where he served as medical technician in San Diego. After the war, he used the GI Bill to travel to Paris to study at the Académie Julian, where he met his future wife Susan Weil. He and Weil went on to attend the Black Mountain College in North Carolina alongside John Cage and Merce Cunningham. Have settled in New York in 1949, Rauschenberg began questioning the nature of painting through works such as Bed (1955) and Monogram (1955–1959), which utilized commercial imagery and mass produced objects. Many of the artist’s ideas foresaw the emergence of Andy Warhol and Pop Art in the 1960s. The artist died on May 12, 2008 in Captiva, FL. 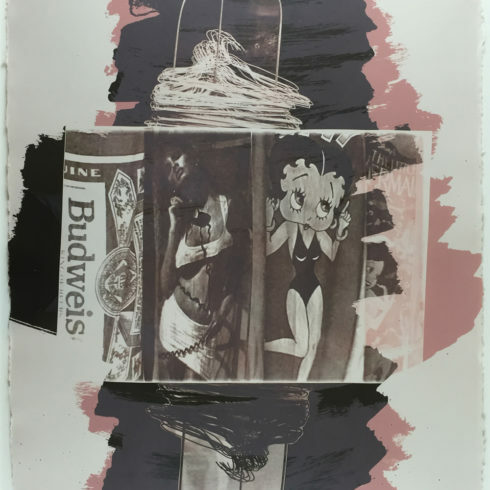 Today, Rauschenberg’s works are held in the collections of the Tate Gallery in London, The Museum of Modern Art in New York, the Walker Art Center in Minneapolis, and the Kunstmuseum Basel, among others.